Greetings fellow blogotrons! In today’s post, I desperately need your advice. Intrigued yet? Read on! As I mentioned in a recent post, my short story The Coin Collector (formerly The Numismatist) has failed to win a place in the Sword & Laser Anthology competition. Tragedy strikes again! Anyhoo, at the suggestion of the lovely Keri Peardon, I have decided to self-publish my short story on Smashwords. Huzzah! Enjoyed the story? Want to read more by Michelle? Check out her debut sci-fi/romance novel, Imminent Danger And How to Fly Straight into It! Or something to that effect. That’s what I was going to go with, anyway. Then the lovely Keri Peardon struck again, suggesting that I include an excerpt of Imminent Danger at the end of the short story. Her theory is that as long as I indicate the length of the short story in the ebook description, no one will be upset by a free preview at the end. I’m a bit worried, though, that people won’t read the description, and will just see “4000 words length” and get upset when the story ends about 2000 words before they thought it was going to. Then again, it’ll be a free download, so they really can’t complain, right? What do you guys think? I’m pretty pleased with it. The treasure chest image is from here: http://www.sxc.hu/photo/178312. It’s royalty free (woo! ), but I will of course be crediting the photographer (“chancey”) in the front matter of the ebook. Thanks oodles! Have a fab Tuesday! More people will read the description or be pleasantly surprised by the preview. Nobody counts word amounts while reading, so you’ll be safe. I think you should definitely include a preview of ‘Immin Dang’; I also think your cover looks fantastic. What you could do is put, in small weeny letters at the bottom of your cover: ‘Also includes a free preview of Michelle’s debut novel, ‘Imminent Danger and How to Fly Straight into It’!’ Everybody likes free stuff. I hope the story reaches an audience of millions! Hmm … okay, so I tried adding the teeny weeny letters, but they were so very teeny that it was very hard to read the words. Alas! Awww but I like my weak border 😀 And yeah, free is definitely free. Hard to complain about that sort of thing. It’s decided! Excerpt is in! I like the cover, nice and simple. And a preview at the end of the book would be a good thing. Make sure you indicate in the description that your excerpt for Imminent Danger is at the back and If possible give the percent mark. I’d add it in the front of your book somewhere, too as a reminder. All free downloaded books don’t get read right away so don’t lose hope if you see downloads and not reviews. Some advice I picked up from a writers group is don’t use your first chapter for an excerpt. Later if someone picks up your book and glances over the first chapter, they will think they already read the book. Taking your advice, I have decided to go with an excerpt from chapter 8. Drastic, I know!!! But the scene’s quite amusing, and I think it stands well on it’s own, so … hopefully it will go over well, lol. Good luck, Michelle. I think it should work. Love the cover, and ESPECIALLY because it’s free, you should absolutely include an excerpt from Imminent Danger. And be sure include a hyperlink so all someone has to do is click on it–impulse buy! I’m not sure I agree with mjdresselbooks about the first chapter, though–I don’t want to read an excerpt that is partially through the story, because I’m not connected to the characters or plot. But that’s me. She’s absolutely right about including a mention in the description, though. Oooh good tip. Okay, so I have added in a hyperlink to Amazon.com … and then they can visit my website if they want to find other sites where they can buy the book. Impulse buy!! Love it. I did end up going with an excerpt partially through the story, but I think it works pretty well. Wow. Haha 100% so far for yes! I think including the preview is an awesome idea. Could you possibly make it shorter than 2000 words? Hmm. Just a thought. I ended up taking an excerpt from chapter 8, so the chunk of text is maybe 1000 words? I think that should be a decent enough length — just enough to give people a taste, but not enough to overwhelm them. Hopefully, lol. I agree with mjdresselbooks that you might want to use a chapter other than the first one as your preview. For instance, you may want to consider using the chapter when Eris first meets Varrin as the sampler (it has more action and the promise of romance). I have a preview of my sequel to “The Flames of Prague” at the end of the book and it’s not the first chapter. In fact, it’s the chapter where the entire family gets denounced as Jews and the action really starts happening (about halfway through the book). I did have to tweak the preview a little, since some things needed explaining in it that won’t need explanation to the person who has been reading it since the beginning, but the sequel isn’t completed, so I have a license to change details a bit anyways. If you needed to tweak a little bit to make your preview understandable to someone coming in part way through the book, that’s okay; most people aren’t going to notice subtle changes anyways, nor expect the preview to match the book word-for-word; as long as the story is the same, a little additional wording (or removal of wording) is okay. Taking your advice, I’ve pulled the section from chapter 8, where Varrin unmasks himself and Eris has a minor mental breakdown from his extreme handsomeness. Hehehehe. And like you said, I did end up having to tweak the preview a bit — change around some pronouns to make it flow a bit better as a standalone piece and whatnot. I did end up going with the white background … black would be have been lovely and dramatic, but A) My graphic design skills are very poor and I don’t know how to get rid of the white background on the image of the treasure chest (lol! ), and B) The story is very fluffy, so it’s totally okay if the cover isn’t dramatic. It’s a really cool picture, isn’t it? Now I need to go find a dragon so I can steal his treasure, lol. Great cover. Simple but effective. (Can I steal your designer). I think a preview is a good idea – although personally, as a reader, I’m not sure about it being a chapter other than the first one. I might be slightly irritated to then download the book, read the beginning and then suddenly hit something an go ‘oh, I know this bit’. Also, if your opening chapter isn’t good enough to hook readers then it shouldn’t be your opening chapter. I’d go for a short preview – or a long blurb. Preview = check! I did actually end up going with an excerpt from later in the book … eh, it’s a toss up. Pull the reader in with a first chapter preview, or show them a dramatic scene from later in the book that will leave them clamoring to find out how that situation came to be? I went with the latter … we’ll see if it works out, lol. Best of luck. Impressed with your design abilities – perhaps if the books don’t sell you could branch out into covers! Just say that’s your style! Also, regarding this: Enjoyed the story? Want to read more by Michelle? I’d drop the first question. It’s implied by the second, more interesting question. 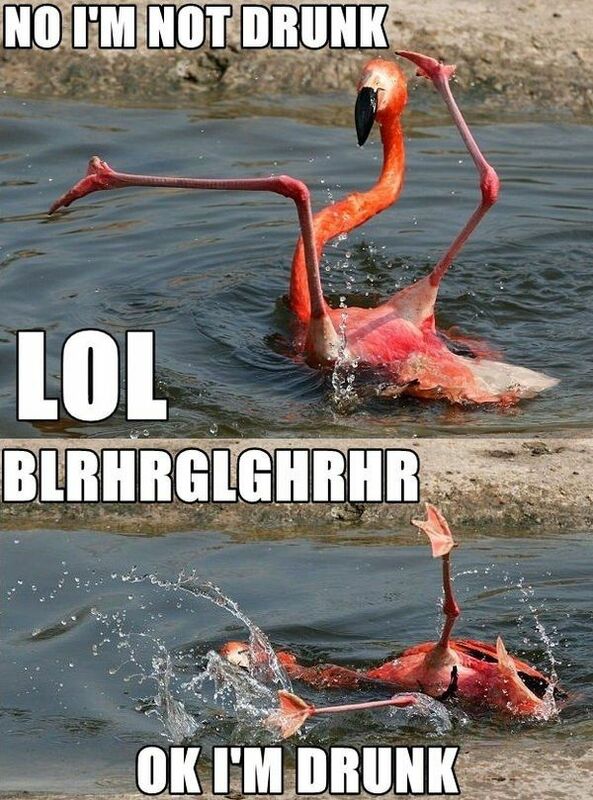 OMG –love the drunk flamingo pictures. Hahaha. Ah, internet, how I love thee. And I went with a short excerpt — like 2-3 pages? — so it shouldn’t be too overwhelming for readers. Very true! My mom just came by and insisted I add a border around the edge of the cover. My response: “But I don’t wannnnnna!” She has no idea how troublesome it is to design things. Sheesh. Count me as one person who doesn’t need or read previews tacked on to the end of something I’m reading. There are other ways to bring it to their attention. Post a page of positive reviews about it. List it as a Published Work by you. I won’t complain about anything included in something I download for free, but once I pay for it, I actually want it to be as advertised. When half of the download ends up being a preview for something else, I begin to question the motives of the author. Not a good place to go to. I’m in the process of doing the exact same thing on Smashwords. I have 3 short stories that were published on ezines and I now have the copyright back. One of the stories is a prequel to my novel. I haven’t done the reformatting for Smashwords yet but this is my next step. I think it’s a great idea! Go! Please be sure to post and let us know how it goes. And best of luck with your short story publishing! Pro tip: when they say “The cover must be 1400 pixels or more wide”, they REALLY mean it. Woo! I mean, I think people already do this — that is, include excerpts at the end of their ebooks — but … good to know that the practice doesn’t annoy the heck out of most people, lol. I think the only irritation comes when there are still two dozen pages (or 5%) of the book remaining and the story ends suddenly – to reveal the excerpt for another book. A reader can be jarred into annoyance. I think a page or two separating the story from the excerpt can help to soften that. If there’s a glossary, or an acknowledgements section – something to lift the reader gently out of the story. Then…JOY…there’s a piece from another story. Happiness abounds! I just downloaded it and am glad there’s a preview of IMMINENT DANGER at the end. I’ve been wanting to check the novel out for a while. It is just so easy, when you’re on your device to click around and end up buying something–especially when you’re enjoying what your reading–so I think it is the right move on your part.